The Master of the Cup – How did these women affect my Shadow? Through my sister I had to learn that I am not the centre of the universe – at least of my mother’s universe – and that sharing can be good, although I was not very happy to share my mother’s love and attention. I am the oldest child so for some time I have got all the attention and naturally it is hard to give that up. Through my teachers I had to learn to shut up, sit down and “drink my milk” even if it’s too hot -see how the cup has a cloud of steam rising from it… by this I mean obedience and listening, even if I know it is not exactly right. I was never brave enough to stand up for myself. 2. 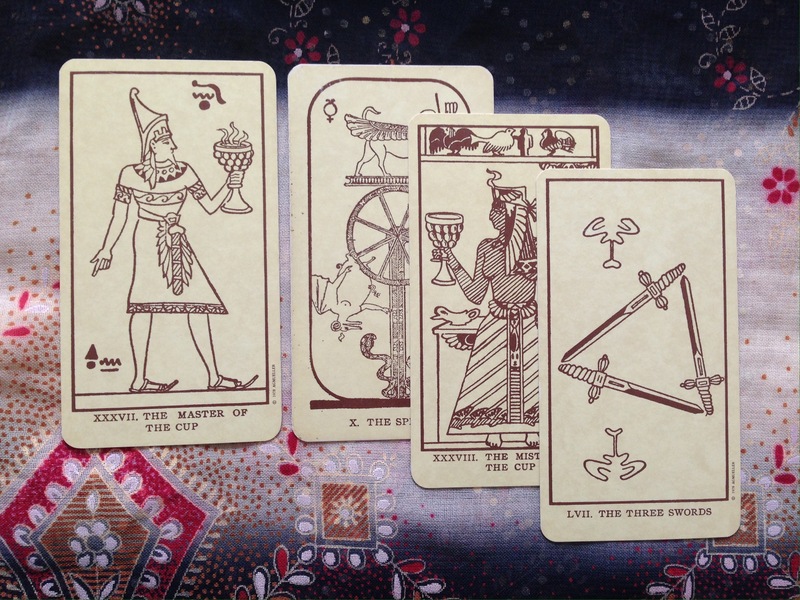 The Sphynx, The Mistress of the Cup and The Three Swords – What part of me did they put there? Accepting that things change all the time is hard, and I guess I am afraid of change after all. I never though I was, but thinking about it now yes, I am uncomfortable with change. The part of me that could say “no, I’d like to have this ice-coffee, thank you very much all the same!” The one that is not jumping to other’s tunes. My cards are: The Magician (hahaha) The Four of Swords, The Ace of Cups, the Five of Wands and the Hermit. 1. The Magi – How did my childhood and puberty affect my shadow? The Magus/Magician is so full of self-confidence he is likely to burst. Exactly the opposit of my childhood self. I was shy, brainy, a bookworm; I quickly had to learn that studying too much will only get you bullied. I have soon stopped being openly brainy… a nice manifestation of the Magi’s deceptive, illusionist side. Based on this I’d say I have issues with showing off my knowledge and with my confidence in general. 2. 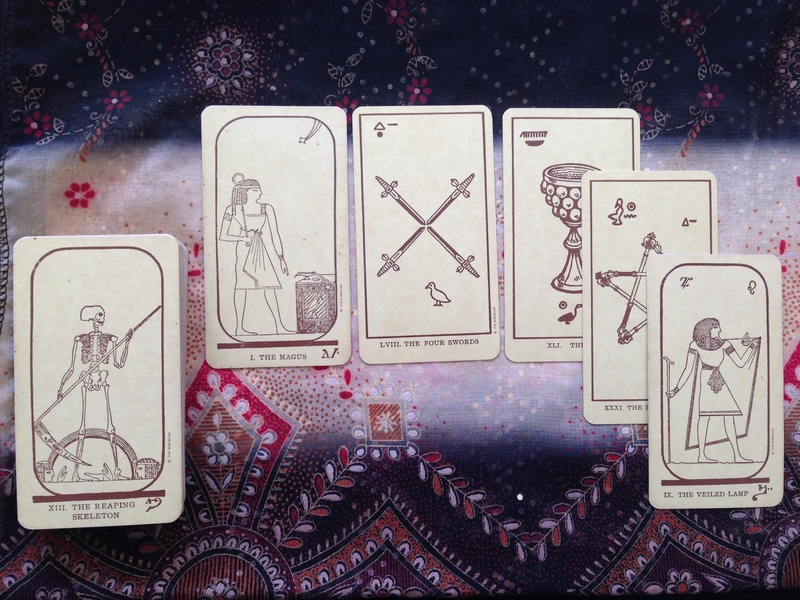 The Four Swords – How did my self confidence evolve? I think we have explored this, hahaha! Actually I loved to perform. Competitions, school events, drama group… the only problem was that I always got soooo nervous that I couldn’t perform to the quality I would have liked. Till date if I have to defend my point of view I get nervous and forget everything I otherwise know by heart. 😀 So yeah… always second place. 3. The Cup, The Five Scepters and the Veiled Lamp – What are the things that have become part of my Shadow this time? Intuition/spirituality, trust in myself and my abilities, the ability to teach others or share my knowledge.